Q. Obviously you got the win today. Is it difficult spending less than an hour on the court in terms of preparation for your next match? RAFAEL NADAL: No. I spend long time first round. Today sorry for him. He felt pain when he was serving. That's what he told me. So I wish him all the best. Hope to see him back on court very soon. No, for me for sure I have to say like every time when that's happens is not nice win like this, but, no, that's sport sometimes. Q. He hurt you with his serve the last time you played. Could you tell that he was not right with the serve today from the start? RAFAEL NADAL: I didn't talk that much with him. He told me that he stop because he feel pain when he was serving. I don't know if from the beginning, I don't know if after the first set. Q. You couldn't tell a difference from the last time you met him? Q. The only time you played him. RAFAEL NADAL: I played him in Queen's. Is another surface. Is completely different. Is no comparation. Q. In your book what you say is, What I battle hardest to do in a tennis match is to quiet the voices in my head. I was wondering if you could talk about that a little bit. RAFAEL NADAL: Well, is tough question to answer now, no? I don't know exactly if I say these words exactly, because is translation from English to Spanish, so I don't know if I say that. Probably the translation is the same, but probably what I wanted to say is not exactly that. But I always say just when you are in a tough situations, you know, try to choose the right thing to do in every moment, the right election. If you have to serve wide, serve wide. Do the right things, you know, because sometimes you think that you want to play three shots to the backhand of the opponent, and at the last moment for the nerves, for everything, you decide to change to the other side. So try to be enough calm to do what you want to do. Q. After your previous match, I believe you said you were a little tentative. Are you feeling more confident now as you're moving into this tournament? RAFAEL NADAL: Is just another match. I think I did few things much better than in the first match. That's an improve for sure. I didn't feel bad today, no. I think I played well, played a good match against not an easy opponent. He is difficult to play. He's doing all the time serve and volley, returning quick. So I tried to, you know, to repeat all the time the same points, try to play with my strategy, try to have the control of the point with my forehand, try to play a little bit more aggressive when I have the chance, and I think I did. So I did what I really want to improve from the first match. I did, so I happy for that. Q. He said after the match that he felt like you didn't have quite the same confidence you had a year ago, didn't feel like you were going for the shots as much as you used to be. Do you think that's correct? RAFAEL NADAL: That's an opinion. Probably that's correct. Nobody's with the same confidence in every moment of his career. That's true. But one year ago of the second round I didn't went for those shots, too. I played defensive match, suffering a lot against Istomin, having 5 1, something like this I think in the tiebreak, for him in the second set. The people remember probably you, too the people remember the last day when you are with the trophy, when you play fantastic the final. But to arrive this moment is not everything a way of roses, no? You didn't play fantastic every match and every moment. And last year I didn't. I improved a little bit every day last year to win the tournament playing very well, and that's what happen thousand of times. In Roland Garros I started this year playing very bad the first week. I played good semifinals and very good final. That's tennis. Not everybody's ready to start from the beginning to play perfect. Sometimes you are not ready to start perfect and you cannot improve during the tournament, so you go back home. That's the sport. We will see if I am ready to improve. I improved a little bit for the third round. I'm happy for that. We'll see next round. Q. Have you had opportunities to see Djokovic, Federer, and Murray, and how would you assess how they're playing? Q. Do you like watching tennis? RAFAEL NADAL: I love tennis (smiling). Q. I mean, when you get away from the court, do you watch as much as you can or do you try to get away from it? RAFAEL NADAL: Not as much as I can. During the tournament I like to watch if an interesting match like Murray, Robin Haase today; Robin is a dangerous opponent. This kind of match you can expect tough match. For sure I love tennis, but I watch tennis every day and I play tennis every day. So when I am at home and there is tournaments there, if there is any match that I like to see or one player that I want to see, I go and see the player, if some friends are playing. But in general I try to do other things. Q. You got through this match relatively easy, unlike Andy's match. In terms of the opportunity to get out there in the second round, and to really get a feel for the court you talk about adjusting. In a way, do you prefer to be tested a little bit, or is it nice to get through in 1 hour and 20 minutes? RAFAEL NADAL: I don't know. I prefer to be in the third round. I don't know. If I have here and I play 3 hours, four sets, tough match, even if I winning, we arrived here and say, Well, you're not playing very well. If you win 6 2, 6 2, and that's happen, you come here, and is not enough to prepare for the next round. So what's best? You never know. The best thing is play very good the next match and try to be in the fourth round. That's the only thing that's positive, no? The confidence is coming every day. I improved a little bit today. Have a day off tomorrow for practice, keep doing few things. I improved I think with the few days off. I did a few things better to prepare for this match. I have another day tomorrow. We'll see. RAFAEL NADAL: For me he's a very dangerous opponent. I had very tough matches against him. How is the head to head? I lost first two, first three, I don't know. I lost against him in Madrid, Paris. I don't remember the other one. I beat him in an unbelievable match in Indian Wells 2009, and I beat him in Miami 2010 probably. Both matches was tough. We'll see. He's dangerous. He's a very good player. We know each other really good. We practice a lot together. He's a good friend. Will be a very good test for me. 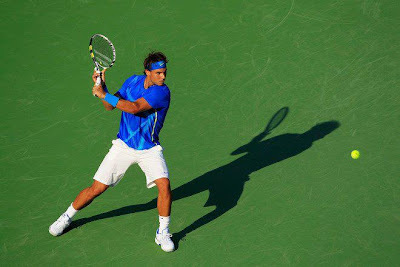 Q. Rafa, in the book you say, Manacor is about as far away from New York as is possible to imagine. I wonder in what ways this sticks out for you from where you grew up? RAFAEL NADAL: Sorry, Manacor is really different of New York. You cannot compare a village to probably one of the centers, biggest cities, busy cities of the world. The life is completely different in Manacor than in New York. Is probably the opposite. Q. Are you comfortable in both, or do you prefer a quieter setting? RAFAEL NADAL: To live, I am more than happy where I am living. I am not ready to change Mallorca for another place, no? I love where I am. I have few things there that I cannot find here, for example. And for sure here there is a few things that I cannot find in Mallorca, too. But if I have to say something, to spend two weeks, is probably the right place to be here in New York. To have a quality life, I will say Mallorca.